The cut of a cigar can make or break a smoke. Next up in our Holy Smokes series, Mike Choi explains how to execute a proper cut, so there’s no room for disappointment. 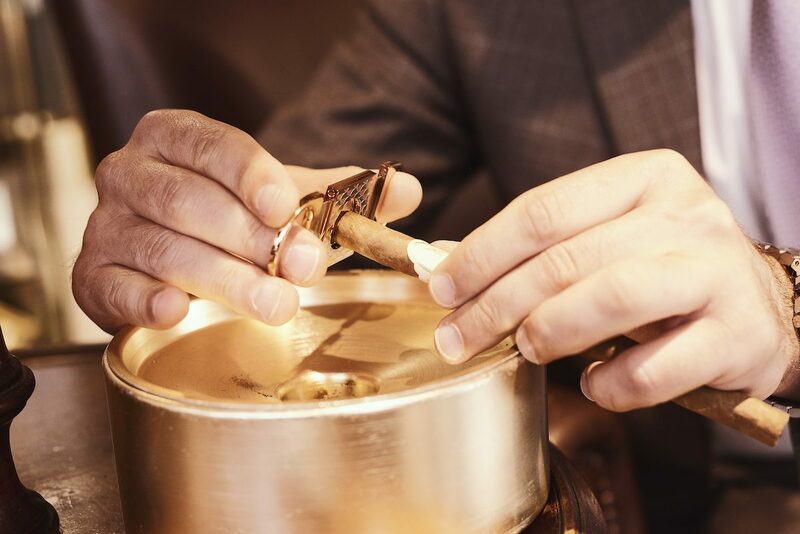 Eddie Sahakian, proprietor of Davidoff of London, cuts his Davidoff 3000 slim guage panatella. Photo by Kim Lang. All handmade cigars will need to be cut in some way or another in order to smoke them. Machin- made cigars are usually cut in advance at the factory. Handmade cigars have a “cap”, this is the small piece of tobacco which is used to close the head of the cigar (it also shows you the end not to light). There is usually a visible line at the bottom of the cap (not surprisingly called the cap line) and you can use it as a guideline. With the cigar vertical and head at the top, you can cut a cigar above the cap line to ready your cigar for smoking. If you cut below the cap line, the cigar wrapper can unravel (you can save this by licking your finger and smoothing it down). There are several options when it comes to preparing your cigar for smoking. Probably the most cliched way of “cutting” a cigar. Biting the top off a cigar is probably the last resort, if you can’t find a cutter of any sort. It’s not the cleanest way to remove the cap off a cigar but, it is possible. It will probably be quite a ragged finish and you’ll keep picking bits of tobacco out of your mouth. Not recommended. For those blessed with long enough fingernails, you can pierce the cap with your nail and with a circular movement remove a section of the cap. Some remove the entire cap but, that can lead to unravelling of the wrapper unless you keep licking the end down. Single blade or double blade guillotine cutters are best to achieve a straight cut. This cut also gives you the biggest surface area to draw from, unlike a punch or v-cut. I often teach new smokers a little trick to give them confidence in using a cutter. Place the cutter flat on the table and open the blades. Insert the cigar vertically. Using your thumb and forefinger to close the blades, close the blades so they are touching the cigar. In a single clean action, bring your thumb and forefinger together and close the blades, you should get a pretty horizontal clean cut. It doesn’t work with piramides or double figurados. Normally you should hold the cigar horizontally or at 45 degrees. Place the cigar between the blades and above the cap line. Close the blades and touch the cigar. In one firm motion, close the blades together to cut the cap. From top to bottom: Hoyo de Monterrey Double Corona (49 Ring); Montecristo No. 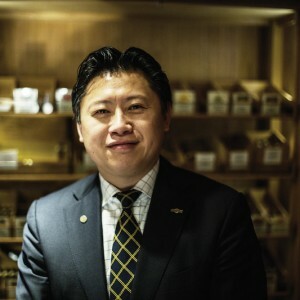 2 Piramide (52 Ring); Davidoff Nicaragua Toro (54 Ring); Cohiba Robustos (50 Ring); H. Upman Petit Corona (42 Ring), all available to buy from Davidoff of London, 35 St James's St, St. James's, London SW1A 1HD. The best way to use cigar scissors is to hold the cigar at 45 degrees and as you cut the head of the cigar (above the cap line), you rotate the cigar. This ensures an even all round cut and doesn’t compress the cigar in two places where the blades make contact. Instead of cutting horizontal to the cap line (the cap line on these shaped cigars is not horizontal but angled), you cut the cap at about 45 degrees. 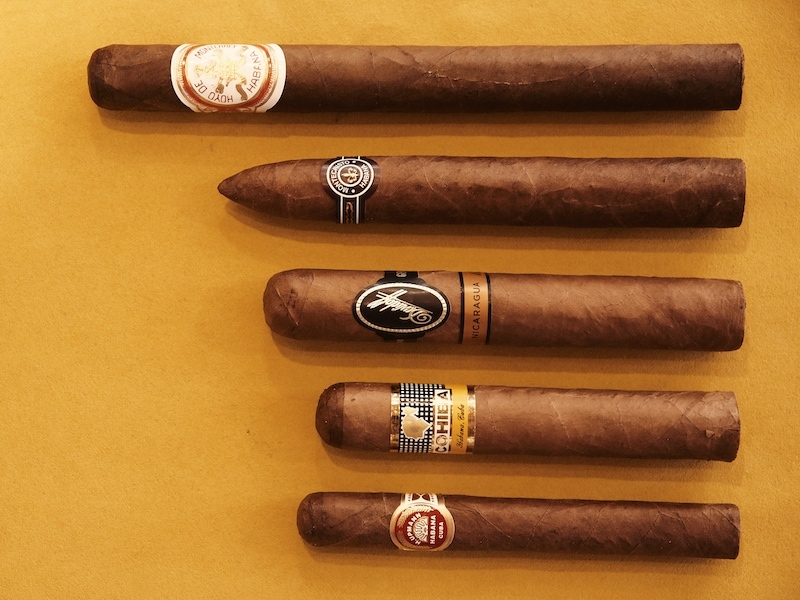 The reason for this is that the heads on these shaped cigars are much narrower than your standard straight sided cigars and a straight cut would only give you a small aperture on which to draw from. The result would be the feeling of a relatively tight draw, when all that is needed is a Cuban cut not a deeper straight cut. The Cuban cut does cross the cap line partially. If the wrapper does unravel, wet a finger and smooth the wrapper down. The angle of the Cuban cut does take a little getting to used as you smoke. The downside to a punch is that the longer you smoke, the more the concentration of smoke is focused into the punch cut. Nicotine and tar builds up and can actually change the taste of the cigar. This can be rectified by using a straight cut to remove a few millimetres more of cap with a straight cut. This is also a type of cut I recommend for people who have a habit of pulling veins out of their cigars. This shape of cut was very popular in the 19th Century. It was also called a Cat’s Eye cutter due to the shape of the cutter area. There has recently been a revival for this type of cut by two cigar accessory brands; Colibri and Xikar. Whichever cut you use, it really is worth trying the alternative cuts as they may surprise you. Most cigar lounges/retailers can provide all of these cutters for you to try. I do recommend you buy the best you can afford. Look at the finish, the weight, the size, the smoothness of the movement and of course the quality and sharpness of the blade. Xikar is the only brand I know that backs all of its accessories with a lifetime replacement guarantee.